*with humble apologies to Dr. Seuss. It’s day eleven of Blogging University: Blogging 101. With two weeks down and one to go, I’ve learned a lot. Places: beach, mountain, forest, or somewhere else entirely? In 1989, single and unencumbered, I flew to Europe with a backpack and stayed for two months. I traveled mostly by train, but also by bus and boat. The best days were those spent on foot, exploring small towns, large cities and everything in between. I covered ten countries in all, including most of the British Aisles as well as France, Belgium, Germany, Spain and Switzerland. I traveled on a shoe string, working from a copy of Let’s Go Europe. Staying in youth hostels made the trip affordable and fun. I met travelers from around the world and in addition to their good company, I learned about other places to stop along the way. It seems a life time ago, and of course in many ways it is. I’ve since married and had two boys, started a small organizing business and moved to San Jose. When I look at this photo, though, all the memories come back. Photographs, much like music or a certain smell, have a way of transporting you back in time. I remember buying the dress I’m wearing and the sweater to go with it. Those comfortable, ubiquitous sandals carried me everywhere. It was a thrill to step foot in this aging town and to learn more about its history. A woman I met at one of the youth hostels snapped this photo on a warm, July day. Then we explored the sites together. We were still buying rolls of film in those days and developing them at a nearby drug store. It was here that I bought the first of many travel patches that I would later sew on my backpack. Of course lots of the memories are lost with the years. Sometimes I want to peer outside of the photos edge, to see what might be there. I remember arriving but not departing and I don’t remember any of the meals. I wonder if I’m really that close to the river’s edge or is it simply an artifact of the camera’s lens? What I do know is this: Traveling alone on another continent was one of the most enriching experiences of my life. There were times when I was lonely, cranky and scared, but they were far outweighed by the interesting people I met along the way and the tremendous sense of independence that comes from finding your way in a distant land. I wouldn’t change it for the world. Can you guess where I am from these clues? This entry was posted in Blogging and tagged Blogging 101, blogging community, blogging from a prompt, Blogging University, dr seuss quote, Dr. Seuss, places, travel, Wordpress, youth hostels. Bookmark the permalink. My guess is somewhere in England. Yes. More specifically, Stratford-Upon-Avon, Shakespeare’s birth place. It is about mid night here, not a good time for me guessing. But the place looks fabulous. Thanks for sharing. I’ve just popped over for a visit. What beautiful photos! They is nothing more empowering than exploring and discovering new things, and new experiences….Thank you for sharing. Thank you for reading, Charlie. I agree! Nope! But I’m guessing it is a canal you are standing by – looking mighty near the edge to me! I’m guessing maybe you are somewhere in the UK, possibly the West Country going by that dress. Possibly Glastonbury? The Shakespeare quote backs up my UK premise, the canal too, the landscape – but that round tower doesn’t look particularly British to me. For some reason when I focus on that I want to say Belgium. I give up I don’t know! It sounds like you had a great adventure and that would have been character and confidence building! And there will be wonderful stories to tell too! Well thank goodness I didn’t fall into the drink and hit my head or I wouldn’t be enjoying this chat with you, Pauline. I cannot get over the fact that we were backpacking in Europe and the UK at the same time!!!! Pauline, what an extraordinary experience. I avoided Rome on my own because of the crime and especially thought it a bad idea to ride the train at a time when passengers were being asphyxiated. Why in the world did they arrest you? Were you terrified? Good gracious, the stories we’ll share. Can’t wait to hear all about it and to sleuth our locations during the time. A couple of others have guessed where I am: standing near the Avon in Stratford-Upon-Avon, Shakespeare’s birth place. That’s the Holy Trinity Church in the background. What a wonderful experience! I can’t guess where you are but you look so thoughtful in that photo. 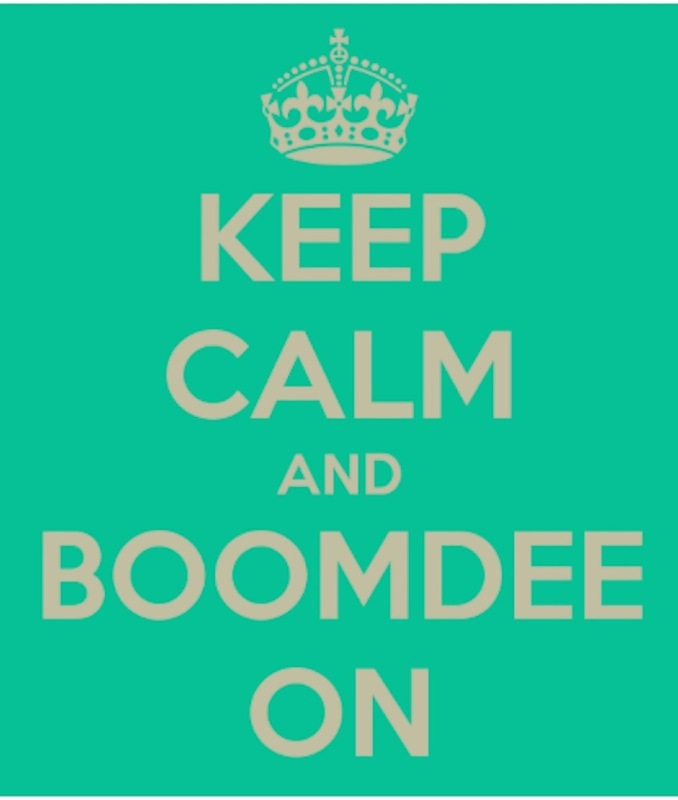 Blogging 101 shakes things loose doesn’t it? Maybe next time. Marlene, it was incredible. Seeing the world is a great way to gain perspective, too. I often think that if everyone, everywhere, gave a year of service in another country, they would see how the other half lives and gain more respect and understanding. Instead of requiring military service, we could teach each other what we know. My personal solution for ending terrorism is to teach and nurture, not punish and hate. That’s a great idea about giving a year of service. Since I’ve lived in so many places including the deep south of this country, I’ve seen a lot others do not. Spend an hour driving through some of the communities here and you wonder what can be done. I’ve learned so much in my travels. I wish others were like you, Marlene. Okay, I am at an advantage as I come from the UK, but I think the quote gave you away… is it Stratford upon Avon? You look so young and happy! I did similar trips alone with a backpack in France and Germany many moons ago – it’s the best way to meet people and I often paired up for a couple of days with other like-minded individuals for gallery visits or a picnic lunch. Yes, a lot of the memories fade, but many remain too! 🙂 A lovely post Alys! Cathy, you guessed it! I majored in theater in college and both read and worked on Shakespeare’s plays. It was so much fun visiting his birthplace, not to mention the overall charm of the place. I was only 29 in this photo, and still couldn’t quite believe that I had pulled it all together and got myself overseas for travel. I loved France and Germany as well, though muddled my way through with my limited language skills. I found that people usually appreciated your efforts. Like you, I also met up with travelers for a day or two here and there. It made it all the more enriching. I’m glad you enjoyed the post. Thank you, Cathy. I agree with Cathy…and I think I see the Holy Trinity Church in the back ground? Bingo! You are both correct. 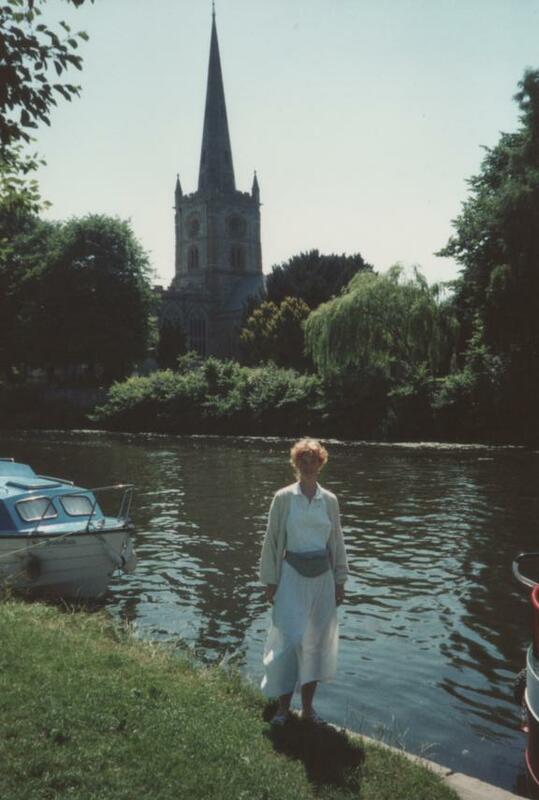 I’m in Stratford-Upon-Avon with the Holy Trinity Church behind me, next to the avon. I studied theater arts in college, so it was especially wonderful to actually visit his birth place. i admire your traveling alone. I have always travel with a friend or husband, but always on trains, buses and boats. The best thing of my travel is the people I meet from other countries. Thank you for taking me back to some fun memories! Thank you, Susie. It was an extraordinary trip. I’m so glad I traveled when I did. I’m glad you’ve enjoyed the blogging 101 entries. I’ve really learned a lot. I wouldn’t have guessed it was Stratford! Yet another fun coincidence, Helen. I’m glad that you too had a similar experience. Have you been back to England since? Only once, sadly, for my Aunt’s funeral. I was there in 2008. It was sad to see her home without her there, but she did live a long life, dying at the age of 95. I hope to go again for a happier time. That would be lovely. Explore some family history etc. Yes, it’s odd to see a place without the person you loved. Me too. I haven’t been back since 1981. Part of me fears the significant changes I’ll see after so many years, and the difference in security since my travels. But, at the same time, it will be good to see it with older eyes and a complete appreciation of this wonderful world. Yes, the older eyes will make a difference, I am sure. Oh my, I’ve come to bathe in all the glory that is Nirvana and find you in England this morning. Look at your mop of hair shining in the sunshine, beautiful ! I’m astonished by all the giant, gorgeous tree’s in the background. It’s so green there. I can’t guess where you are because I’ve learned the answer on my way down, hehe. Since it’s snowing out my window this very moment, I shall relish the image and say hooray for independence and adventure. I was a different time, and yes those times have changed. I did have a few small scares that I had forgotten before rereading my journal, but nothing that amounted to anything. The youth hostels are safe, welcoming places to stay, and so affordable too. What fun to travel to Hawaii with girlfriends, especially at so young an age. I was 28 the first time I went, also with two girlfriends. It seems like a lifetime ago. Yes, those rooms with a view and a breakfast tray are pretty special, especially when you’re there too.